Everyday Diversity reviews and categorizes book choices for storytime, focusing on books with people of colour and Native Americans. 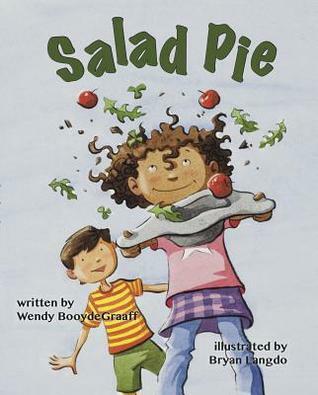 I'm thrilled that SALAD PIE was included in the July Roundup. An empty playground is the perfect setting for Maggie to make "Salad Pie" (a cleaner version of mud pie), but then Herbert shows up and--even worse--he wants to help. Maggie bossily rejects his attempts to help until she accidentally slips down the slide, dropping the salad into the air. Herbert saves the day by catching both her and the pie, and their friendship is solidified as they make plans to make "Sandwich Stew" tomorrow. "Into the oven," said Maggie, and she closed the imaginary oven door with panache. Gently, ever so gently, Maggie danced her jig. Softly, ever so softly, she sang, "Salad Pie, oh Salad Pie! Soon you'll be ready, Salad Pie! Yes, that is one interesting Salad Pie! Thank you, Brighton Barnes & Noble for hosting the Little Readers, Big Dreams event. Clockwise from below you see me with SALAD PIE, Mary Ann Riehle with THE LITTLE KIDS' TABLE, Lisa Wheeler with THE PET PROJECT: CUTE AND CUDDLY VICIOUS VERSES, and Jordan Scavone with MIGHT-E! Greyson took Salad Pie into his own hands and made a new creation. He's even got his own take on the shiny, crinkly gum wrapper. Naturally gifted, indeed! Salad Pie on display at Literati in Ann Arbor; Fellow author Lisa Rose and her daughter, Victoria, came to visit. Visit Kathy Temean's Writing and Illustrating blog for a peek into my journey to publication and a book giveaway. Enter by February 22, 2016.